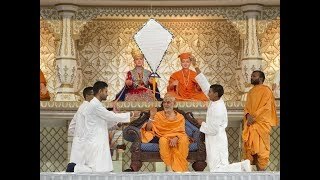 A special Kishore-Kishori Din was held in the presence of Mahant Swami Maharaj on Sunday 1 October 2017 at BAPS Shri Swaminarayan Mandir, London. Entitled ‘Malya Shri Hari Sakshat’, the event brought together over 500 attendees from various parts of the UK and a few countries in Europe to consolidate their understanding of attaining the manifest form of God and the divine happiness experienced through this spiritual realisation. Kishores began the programme by singing kirtans during Swamishri’s puja which underlined the spiritual significance and virtues of the Satpurush. Swamishri addressed the gathering and explained the importance of ‘Prapti’ - the spiritual attainment of God and the Satpurush - and understanding their spiritual greatness. Swamis explored the virtues and inclinations of Swamishri in detail thereafter in the ‘Parichay’ session. They drew upon scriptural references as revealed by Bhagwan Swaminarayan and also reflected upon Swamishri’s compassionate and peaceful personality which has inspired countless on the spiritual path. Swamishri arrived in the assembly shortly after 11am and blessed the kishores individually. A question and answer session followed, where he offered practical guidance to the challenges that youths face during various aspects of their lives, and expressed his own inclinations for them on their spiritual path. He also revealed himself, when asked to give an introduction, as the "param ekantik sadhu". All attendees were given an opportunity to send personal messages of spiritual reflection to Swamishri thereafter, in which they expressed their innermost feelings. 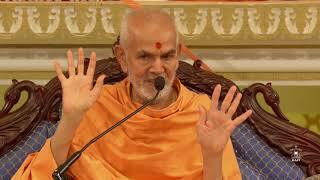 Swamishri provided guidance and encouragement for all. He concluded the morning programme by asking all attendees to see the good in each other and to remain steadfast in following their spiritual observances. The evening session focussed on ‘Prasang’ - personal association with the Satpurush - which began with video presentations depicting the compassion that Pramukh Swami Maharaj and Swamishri have bestowed upon swamis and devotees. Swamis further explained the various mediums through which the Satpurush bestows his happiness upon aspirants. Swamishri was honoured with various garlands of flowers that had been prepared for him by kishores and kishoris. Youths narrated a series of individual memories with Pramukh Swami Maharaj, portraying the fulfilment that they experienced through his darshan, discourses and meetings, and the happiness that Swamishri provides today. Swamishri candidly shared some breathtaking experiences of his own with Yogiji Maharaj and Pramukh Swami Maharaj. The memorable day was brought to an end with uplifting memories of the Guru Bhakti Din with Pramukh Swami Maharaj in 2000.